Although it is today overshadowed by many of Europe's more prominent government mints, the Royal Dutch Mint (Koninklijke Nederlandse Munt) boasts an impressive history that traces back to the 1500s. The Netherlands' flagship silver coin, the leeuwendaalder (literally, "lion thaler"), was an especially important trade coin in the 17th and 18th centuries. The Dutch daalder featured prominently alongside the Spanish 8 reales (also known as the Spanish pillar dollar) and Maria Theresa thaler of the Austro-Hungarian Empire in global trade. This time period was, in fact, the beginning of colonialism and the early era of growth in shipping and international trade, when something approaching "global" channels of commerce first flourished. The Dutch played a central role in this evolving world. The first leeuwendaalder coins, struck from .750 fine silver, were minted in 1617. The reverse image of the lion and obverse image of a knight became the standard for the silver daalders commonly found in circulation in Anatolia (modern-day Turkey), Egypt, Syria, and across North Africa (in addition to the Dutch East Indies in the Caribbean). Daalder is the Dutch word for thaler, the German origin of the contemporary word "dollar" in English. Like the population of the U.S., the forebears of American coinage draw from an array of different nations. For example, the specified weight of silver that defined the U.S. dollar in early legislation was in part inspired by the 8 reales; the choice of the name "dollar" was borrowed directly from Dutch and German concepts of a large silver coin. 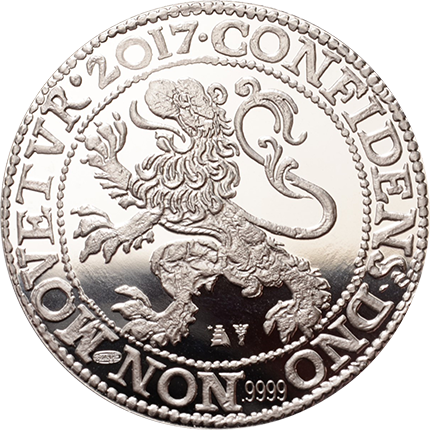 Fifty years after the founding of the Royal Dutch Mint, the now-famous rampant lion design from the coat of arms of the Netherlands appeared on silver daalder coins for the first time. Yet thanks to the presence of many smaller mints, as was the case in Britain, the Royal Dutch Mint didn't become the exclusive facility to strike the country's coins until 1807. Measuring 38.7 mm in diameter, each coin is struck from at least .999 fine gold or silver, depending on the metal. Preliminary images of the coin designs published by the industry news site Coin Update seem to show that the coins will be .9999 fine. Rim inscriptions on the coins will read: "MO. ARG. PRO. CONFOE. BELG." All of this alphabet soup of abbreviations translates to "silver money of the Province of the Netherlands," from the full Latin "MONETA ARGENTEA PROVINCIARUM CONFOEDERATUM BELGICARUM."